Anyone who tuned into tonight’s debate expecting something new from Georgia gubernatorial hopefuls, Democrat Stacey Abrams and Republican Brian Kemp — Libertarian Ted Metz was there too for comic relief — was probably disappointed. I don’t simply mean that both major-party candidates repeated points they’ve made throughout the campaign. The whole debate was an ancient argument between those who believe a Deep South state like Georgia needs a government committed to equality and full voting rights for the previously excluded, and those who believe the status quo — or even a leaner, meaner version of the status quo — is just fine. Kemp has promised a tax cut, a teacher pay raise (financed by some sort of spending cap), and anti-gang measures, but spent most of the debate as he’s spent most of the campaign — attacking Abrams as an “extremist” who wants to raise taxes and let undocumented immigrants vote and receive government benefits. Like his supporter and role model, Donald Trump, Kemp built his attack lines around a carefully constructed set of mischaracterizations (to use the charitable term) of Abrams’s actual agenda, mostly based on dubious cost estimates of a single-payer system that she’s embraced as an ultimate goal, but not as anything she’d try to enact as governor. Abrams hammered away at the many fiscal, social, and economic advantages that Georgia would derive from the Medicaid expansion that the state’s Republicans have prevented (noting repeatedly that Vice President Mike Pence accepted an expansion as governor of Indiana). She sharply distinguished herself from Kemp on criminal justice reform and, in a sadly brief section on education policy, the Republican’s support for private school vouchers. But much of the debate was an extended slugfest over Kemp’s record as election supervisor during his last eight years as Georgia’s Secretary of State — and Abrams’s challenges to his phony war against “voter fraud” in her capacity as the state’s most prominent voting rights champion. 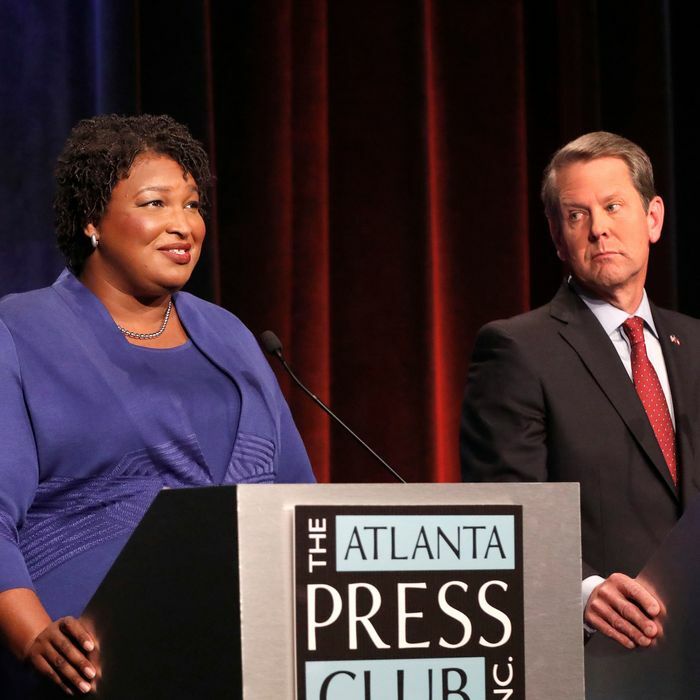 Sometimes their arguments got into the weeds, particularly over the significance of the many lawsuits filed (and some settled in the plaintiff’s favor) against Kemp for voter suppression. But in general, Kemp kept attributing any loss of voting opportunities to the ineptitude of those being effectively disenfranchised (or of their advocates, like Abrams), asserting that “it’s easier to vote in Georgia than it’s ever been.” That this might not be the ideal standard to apply in a state with Georgia’s history did not seem to occur to him. Abrams on more than one occasion accused Kemp of introducing a climate of fear towards those trying to exercise basic rights, and Kemp all but laughed, citing rising voter rolls (hard to avoid in a state with recent population growth like Georgia’s) as the only rebuttal he needed. The two candidates also exchanged blows over their mutual history of shaky personal finances, though Abrams’s argument about placing her parent’s livelihood and health above any personal debts (even to the IRS) seemed more passionate than Kemp’s evasion of questions about business debts. That all seemed a wash.
Abrams was asked in the very first question from a panel of reporters about the story that surfaced just today about her involvement in a 1992 protest at the State Capitol that included the burning of the state flag, which at that time prominently featured Confederate insignia (placed on the flag in 1956 as an act of defiance to civil rights efforts). She answered by noting the peacefulness of this authorized protest, and its consistency with then-Governor Zell Miller’s position on the flag. Kemp did not comment on her answer, and it did not come up for the remainder of the debate. To my not entirely impartial eye, Abrams was the better debater on style points, speaking quickly but clearly, and remaining reasonably responsive to questions, while Kemp radiated smugness, and repeated his “extremist” mantra about Abrams as often as he could. Her closing statement was entirely about her own agenda. His was mostly about her “radical” intentions. The debate probably won’t change many minds. As the Libertarian Metz taunted (in a rare departure from his own mantra about the wonder-working power of legalizing industrial hemp), he’s likely to get enough votes to force a post-November runoff, since Georgia requires a majority vote, even in general elections. And they will debate again on November 2.